The following article is reprinted with permission from the Vitality supplement to the Oakland Press newspaper. Click here to read the story on the Oakland Press website. The photo is of “Mary Lou Krzyminski of Roseville a Retired Senior Volunteer at the Detroit Zoo.” The photo is credited to David Dalton. The article is written by Debra Kaszubski, for Digital First Media. Mary Lou Krzyminski’s coworkers at her volunteer gig include macaroni penguins and house full of colorful butterflies. In the warmer months, she mingles with giraffes, lions, a herd of peacocks, numerous curious human families, and more. The Roseville resident is a volunteer at The Detroit Zoo, a job that’s perfect for this educated, energetic former school teacher. Krzyminski is involved with the Retired Senior Volunteer Program (RSVP), a nonprofit that helps adults ages 55 and older find volunteer opportunities that suit their interests and abilities. RSVP is sponsored by various organizations across the country. 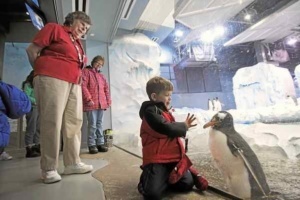 The work at the zoo is a perfect match for Krzyminski, who retired 19 years ago from Warren Woods School Middle School, where she taught life science and math. She’s a Zoo Ambassador in the spring in summer, during which time she walks the zoo’s sizable grounds answering questions. In the winter, she works in the butterfly house and in the new penguin exhibit. She’s at the zoo an average of four days a week and has been serving there for the past 15 years. RSVP helps seniors interested in finding a volunteer experience that best suits their skills and interests. The range of local volunteer opportunities is huge, including: playing music in a hospital lobby, visiting homebound seniors, gardening to raise food for food banks, teaching exercise classes to seniors, transporting the disabled to appointments or running their errands, packing or delivering food for Meals on Wheels, completing home repairs or chores for the disabled, being a docent at a cultural institutions, and assisting in classrooms for the young as well as adult literacy. Volunteering can be something you want to do to add dimension to your life. A number of people volunteer to be in the community, and are not specific about the mission of the nonprofit. If it’s going to be too time consuming or too difficult to get there, it might not work out. Krzyminski likes the flexibility offered by the zoo, she said. There are so many people in need and organizations doing good work in metro Detroit. The aging population is increasingly in need of hot meal delivery, companionship and chore services, schools can use adults to read with young students and tutor them in math, veterans need assistance understanding and accessing their benefits, and the food and housing insecure need emergency assistance and knowledge of available resources, Johnson said. Wherever you decide to serve, chances are good that you’ll gain as much as you give. “Volunteering can help put your own difficulties in perspective. Volunteering at a food bank, with homebound seniors, adults learning to read or speak English or infants with health issues can make your plumbing or car problems seem much more manageable,” Johnson said. In Oakland and Macomb Counties, those interested in finding volunteer opportunities through RSVP can contact Johnson at Catholic Charities of Southeast Michigan at johnsont@ccsem.org or 248-559-1147 ext. 3941. Wayne County residents can call 313-883-2100. RSVP staff will explain the program and mail an application.